This vinyl available from Crosstalk, Reggae Record, Juno, and more. 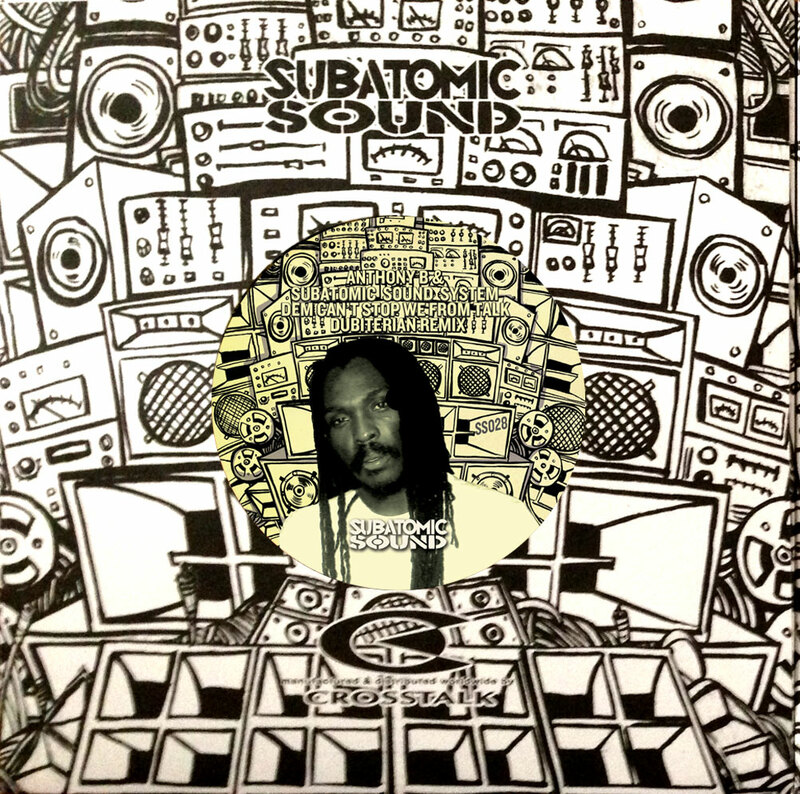 The second 45 in Subatomic Sound’s new limited edition sound system vinyl series, SS028 “Dem Can’t Stop We From Talk” features a previously unreleased remix of the Subatomic Sound System & Nomadic Wax “NYC-2-Africa” riddim by Brazilian producer Dubiterian with Anthony B’s blistering “Dem Can’t Stop We From Talk” vocal burning up the A-side plus a dubwise version on the B-side. 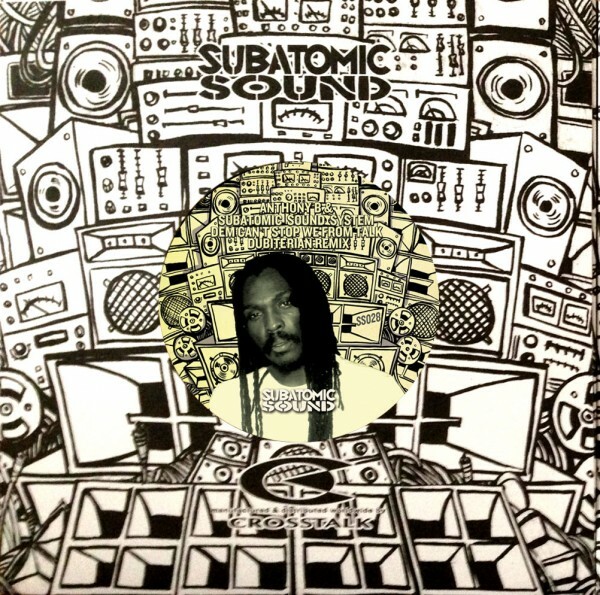 Recorded and produced across Senegal, Jamaica, New York City, and Brazil, this tune packs a heavyweight energy that has been igniting the dance in Subatomic Sound System sets worldwide over the past year. Now available as a 7″ vinyl exclusive! Selectors get this one in your record bag. “Dem Can’t Stop We From Talk” boasts the most big remixes of any tune on the Subatomic Sound label. Check the digital remix release for more versions. THE ARTISTS: Hailing from Trelawny, Jamaica, Anthony B is one of the world’s leading conscious roots and dancehall reggae singers, known for his high energy concerts and revolutionary lyrics. Spearheaded by producer, DJ, and instrumentalist Emch, New York City’s Subatomic Sound System is at the forefront of a dub music renaissance, founders of the US & Europe Dub Champions Festival, 4 years acting as the live band for legend Lee Scratch Perry on tours including Coachella, Red Bull Music Academy; plus independently touring N America, Europe, and Asia, and for a decade producing flavors ranging from classic dub to dubstep. Dubiterian is a Brazilian based reggae producer and arguably South America’s finest melodica player, specializing in rootical dubwise reggae. He recently relocated to Cologne, Germany. Anthony B recorded his vocal in Kingston in April 2010, as the the city broke out in riots capped off by the Tivoli Gardens extradition raid. Tensions were further heightened by a drought that led to water supplies to many of Kingston’s residents being cut off for days at a time. Anthony B linked with People’s Records & Subatomic Sound in the studio and his eyes lit up when the Senegalese drums of NYC-2-Africa riddim started to play. He began a classic African call and response chant with his crew as the beat played and after listening to the riddim on steady repeat, headed straight into the studio, delivering a blistering performance, waiving his lighter and literally jumping off the walls of the vocal booth while tracking the vocal.